Boise State’s Chandler Hutchison has flown under the radar for most of the 2018 draft process, but in a draft full of potential wing players, Hutchison projects to be one of the top small forwards selected on Thursdays’ draft. With the potential for the Nuggets trading back in the first round being possible, Hutchison could be a potential target seeing that he would fill a position of need and that he is one of the drafts’ best wing players. During Hutchison’s four years at Boise State, he was able to grow into one of the best players in the Mountain West Conference. The former Mission Viejo High School standout was Boise States’ highest rated recruit in the schools history so he had high expectations the moment he arrived on the campus in Boise — he certainly didn’t disappoint. Hutchison proved during his freshman season that he had potential to be one of the schools’ best players when his career was all said and done. After starting 18 straight games to close out his freshman season, the Broncos went 15-3 after giving Hutchison a chance to be in the team’s normal rotation. Hutchison’s starts dwindled during his sophomore season though, but even with just eight starts, Hutchison was still able to almost double his minutes per game (19.8) and ended up doubling his points per game at 6.8. After two solid seasons to start his career in Boise, Hutchison’s game took a major step forward during his junior season after he started all 32 games for the Broncos and averaged a team high 17.4 points per game. Hutchison’s breakout season earned him All-Mountain West first team honors after scoring double-figures in 29 games and collecting 20+ points and 10+ rebounds in six different games. After his junior season, Hutchison declared for the NBA draft, but wouldn’t hire an agent with the ability to return to Boise for his senior season. After working out for the Boston Celtics and Los Angeles Clippers, Hutchison decided to return to Boise for his senior year and continued to work on his game with the hope of being one of this years drafts best players. The decision paid huge dividends for Hutchison as he won the Mountain West Player of the Year after averaging 20 points, 7.7 rebounds, 3.5 assists, and 1.5 steals per game. Hutchison became the first player in Boise State history to lead the team in points, rebounds, assists, and steals over a full season while also adding an All-Mountain West First Team and All-Mountain West defensive team to his already astounding player of the year honor. Hutchison’s senior year was highlighted by his career-high 44-point performance that came in a conference victory over Mountain West foe San Diego State on January 13th. If Hutchison’s draft stock wasn’t already solidified enough, his offensive outburst against one of the best defensive teams in the nation certainly put the NBA world on notice. According to Hoops Hype, Hutchison has worked out for the Minnesota Timberwolves and Chicago Bulls ahead of Thursday’s draft. Both seem like potential landing spots for Hutchison as both teams could use help on the wing and both teams are picking in the early 20’s. Hutchison’s early 20’s potential is what makes him such an intriguing prospect for the Nuggets if the team does end up trading back into the ladder half of the first round. On paper, Hutchison fits the type of player the Nuggets are looking for; team first, an offensive playmaker, and projects to be a solid defender at the next level. The projection of Hutchison to be a solid three-and-d player at the next level is what makes him such a touted prospect, so lets find out more on the former Boise State Bronco and examine whether or not he’d be a fit here in the Mile High City. One of the best parts of Hutchison’s game is his ability to score the basketball and score it efficiently. A lot of NBA prospects posses the ability to score the basketball whether that is near the rim, from the mid-range, or behind the three-point line, but in Hutchison’s case, he doesn’t have just one of those moves in his arsenal, he possess all three making him a three-level scorer. This move that Hutchison put on at Utah State last season will be familiar to Nuggets fans considering it’s one of Gary Harris’ signature moves. The reverse finish by Hutchison is something that most 6-7, 200-pound small forwards don’t usually posses in their game. Here’s another example of a more conventional way in which Hutchinson can score at the rim. That dunk showcases Hutchison’s explosiveness and ability to finish at the rim with power. Hutchison’s scoring ability from two-point range has only improved throughout his four years at Boise State as his percentage went up from 37 percent during his freshman season all the way to 52.3 percent during his senior season. Hutchison’s offensive game grew more and more every season in college, but his biggest area of growth came with his shot behind the arc. During his freshman and sophomore seasons, Hutchison shot below 30 percent from three including an atrocious 23.1 percent from three during his sophomore season. That number skyrocketed during his junior season though as he averaged 37 percent from three and followed that up with a 35.9 percentage during his senior season. More outside shots falling only helped Hutchison’s confidence grow as he shot almost four more three pointers per game during his senior season than during his freshman season. Hutchison’s improved three-point shot was on full display last season when he dropped 44 points on San Diego State after going 7-10 from beyond the arc. That three by Hutchison showcases his ability to knock down a three-point shot from range, which will only help him with the NBA three-point being more stretched out than in college. Hutchison also has the ability to make the mid-range jumper and shoot it effectively off the dribble. Here is Hutchison showcasing that bounce off the dribble and showcasing that mid-rage jumper right in the San Diego State defenders eye. The last thing that Hutchison does really well on the offensive end of the floor is finishing in traffic and his ability to get to the free-throw line. Hutchison shot a career high 72.8 percent from the free-throw stripe last season and shot a career high 7.2 free throws per game. Here’s Hutchison showcasing his coast-to-coast ability, while also drawing a foul for the chance at a three-point play. That shot came against UTEP last season during the opening round of the Puerto Rico Tip Off. The Broncos would ultimately win the game and the closing seconds really showcased Hutchison’s game as a competitor and showcased his will to win. With his team down in the closing seconds he took it upon himself to go coast-to-coast and ended up finishing what would be the game winning basket. That play is Hutchison’s offensive game in a nutshell and just showcases the effectiveness and competitiveness that he plays with on the offensive end of the floor. In each of his four seasons in a Boise State uniform, Hutchison improved his rebounding numbers and even led the Broncos each of the last two seasons in rebounding. Averaging 7.7 rebounds per game during his senior season, Hutchison brings a lot of his rebounds down on the defensive end of the court. Even with almost seven of those rebounds per game coming defensively, Hutchison still averaged nearly one offensive rebound per game and showed a high basketball IQ in terms of boxing out and knowing where to be when the rebound is coming down. 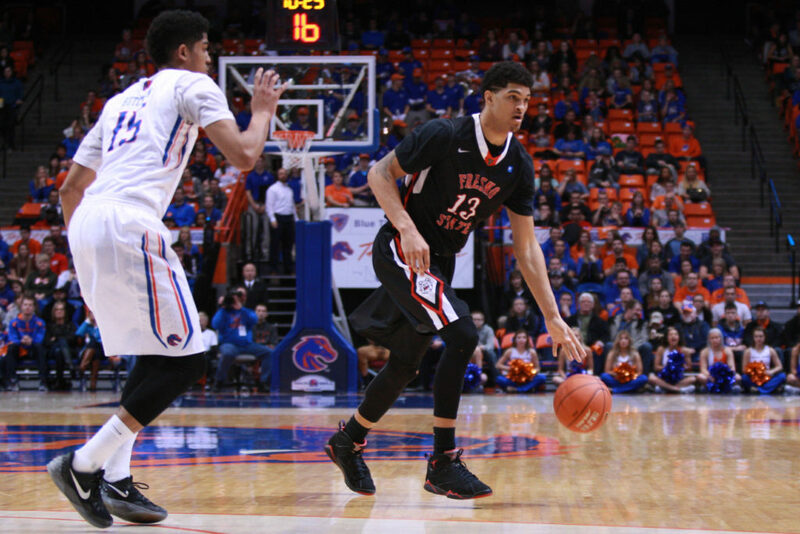 Just like with his offensive game, Hutchison’s rebounding improved throughout his four years at Boise State. Hutchison’s ability to grab rebounds on both ends of the court will help his team with potential second-chance points and the ability to get out and score in transition. Those extra possessions and fast-break chances is what makes Hutchison’s rebounding such a big part of his game and it’s one of the reasons why he’s more than likely going to be a first-round pick during Thursday’s draft. With an All-Defensive first team award already on his resume, Hutchison has shown the ability to be a solid player on that end of the court. With Hutchison having 6-7, 200 pound frame, he has an NBA-ready body to use of the defensive end of the court. Throughout the last couple of seasons, Hutchison has usually been the player guarding the opposing teams’ best player every single night and it’s something he’s done an admirable job of. During his last season at Boise State, Hutchison recorded a 2.2 in defensive win shares, which was his highest during his four seasons at Boise State. Hutchison also averaged 1.5 steals per game and showed a knack for getting into passing lanes and making the most of his opportunities when a steal was possible. The only defensive issue that Hutchison has is his shot blocking ability seeing that he’s never averaged over .5 blocks per game in any of his four college seasons. Even without blocking shots, Hutchison proved to be a solid defensive player during his senior season and seems to posses the ability to be a solid two-way player from the moment he steps into an NBA locker room. In Hutchison’s case, he doesn’t have as many weaknesses as some NBA prospects tend to have. Hutchison’s case is much more different though in that he played all four years of college and was able to grow his skills every single season. A lot of college players now will take advantage of the one-and-done rule and and enter the NBA after just one year in college, but, in some cases, players will take advantage of the four years of eligibility they’re granted and attempt to acquire all the knowledge they can about themselves and about their game during their four years at the collegiate level. Playing four years at Boise State can be both good and bad for Hutchison. It is good in that his game is polished and there are not any glaring weaknesses that an NBA coach will have to work on with him on when he gets drafted next Thursday, but — at the same time — Hutchison is now 22-years-old and is a lot older than this years’ top prospects. For example, Deandre Ayton, Marvin Bagley, and Michael Porter Jr. are all 19 years old. This puts Hutchison at a huge disadvantage considering teams draft for upside, and the 19-year-old who plays the same position as the 22 year old will get drafted nine times out of 10 for that reason alone. The biggest reason as to why teams value potential over experience is that teams are betting on the upside with the 19-year-old prospects, while they see an already nearly complete player in Hutchison and are betting on him not getting much better at the NBA level while continuing to be a similar player that he was in college at the next level. This may be a little nit picking, but even the best of players sometimes have to improve consistency in their game. In Hutchison’s case, he tends to struggle with turning the ball over because of his constant ability to try and make good things happen. As ‘the guy’ at Boise State last season, Hutchison averaged a career high 3.4 turnovers per game, which is a number that has to take a drastic decline at the next level. We’ve talked about how solid a rebounder Hutchison is, but even that part of his game could use some improvement. Hutchison averaged just 0.9 offensive rebounds per game last season, and averaged just 1.1 offensive boards per game during his four-year career in Boise. Small forwards in the NBA are often tasked with crashing the boards and attempting to haul in extra possessions for their team, and it’s a challenge that Hutchison will face in his first NBA season. The last and potentially biggest thing that Hutchison will need to work on is his shot blocking ability. Hutchison averaged just 0.2 blocks per game during his time in Boise and that is a number that needs to rise in order to impact his defensive upside. With Hutchison guarding positions one through four in college, it gives him the experience he needs in order to help him grow as a shot blocker at the next level. Just because we haven’t seen him succeed at it yet doesn’t mean he can’t do it, but it certainly is a question mark and it’s something that could really elevate his game at the next level. Chandler Hutchison has the potential to be a solid NBA player for the next 10 years. The explosiveness and aggressiveness in which he plays with is something that’s contagious in today’s NBA. His high flying athleticism and scoring ability is something that will help whoever drafts him from the moment he walks in the building. Hutchison’s offensive ability rubs off on the defensive end of the court as well as he was often tasked with guarding the opponent’s best player night in and night out at Boise State. Playing so well on both ends of the floor allows teams to project Hutchison as a solid three-and-d type of player at the next level, and that’s a position of need with the Nuggets. It would be tough to select Hutchison with the 14th pick, especially if guys like Miles Bridges, Zhaire Smith, Shai Gilgeous-Alexander, or Troy Brown Jr. are still on the board, but, if the Nuggets end up making a trade where they acquire a pick in the 20’s, then that might make Hutchison a potential target for Denver.